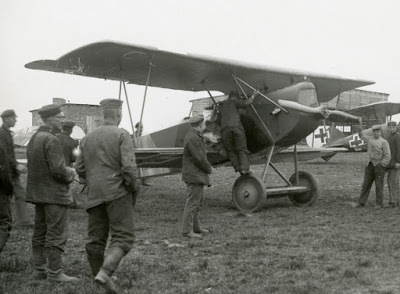 Today we bring you a photo showing the last variant of the famous heavy bomber series produced by Gothaer Waggonfabrik AG during the Great War... the Gotha G.Vb. 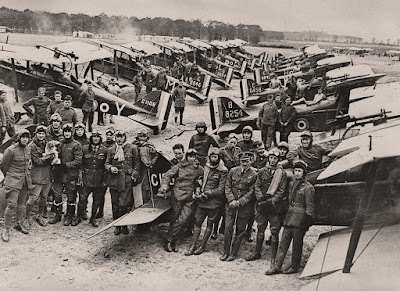 Once the war had come to an end, a stipulation of the resulting Armistice was that Germany hand over a large number of aircraft to the Allies... about 1700 or so. 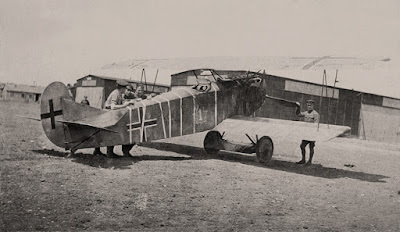 Among those specified to be surrendered was the Gotha G.V, and apparently a number of the final G.Vbs to come off the assembly line were delivered to the Allies direct from the factory. It is thought that the aircraft shown here is one of these. 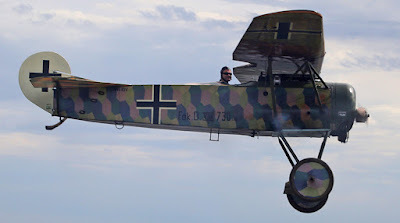 Alrighty folks, as stated in the past... your blogmeister loves these crates from the 'Great War', but knows relatively little about them as compared to aircraft from other periods in time. 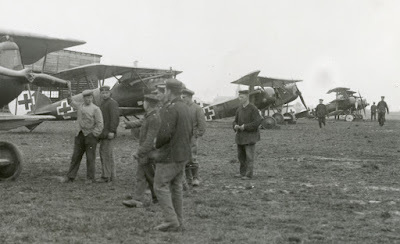 All he knows about this photo is that it is said to have been taken in Northern France during the Spring of 1918 and that it shows three Fokkers D.VII, at least two, possibly three Fokkers Dr.1, and a single Albatros, which looks to be a D.V., maybe. Anyhoo, the only other thing your blogmeister knows about this photo is that it is dang groovy... enjoy! 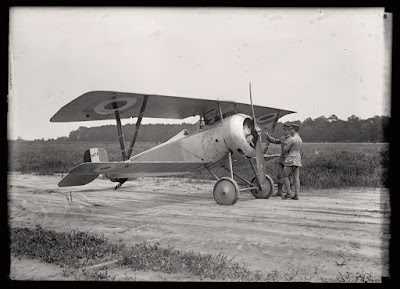 For today's quickie we present this view showing Fokker D.VII 8493/18, one of about twenty of the type to be operated briefly by No.1 Fighter Squadron of the Canadian Air Force during early 1919. 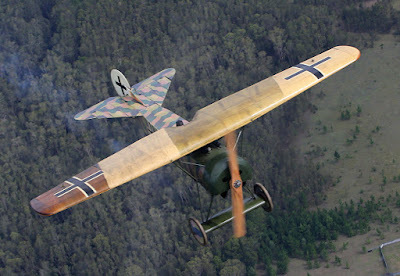 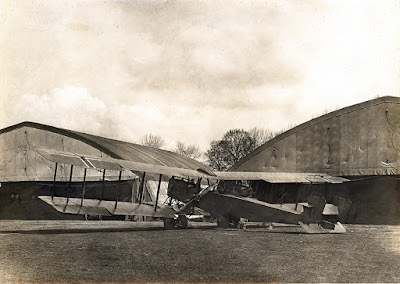 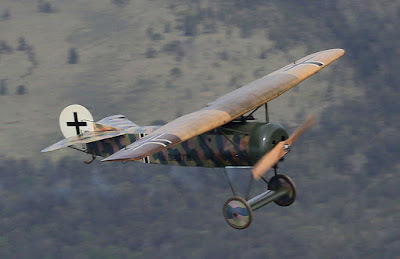 For much more info and several more photos showing Canada's Fokker D.VIIs, take a looksee HERE. In our last installment we shared a few photos showing a Nieuport 17 that was under evaluation at Langley Field during June of 1917. 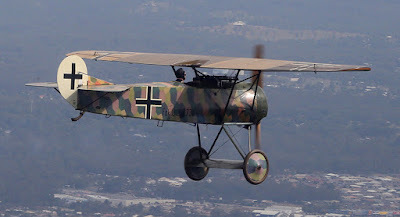 As stated in that previous ish of our little cyber-rag, many a foreign type was given a look by a U.S. Army that had recently been committed to the fight, was pitifully unprepared as regards things aviation, and intent on catching up to the European powers in this area. 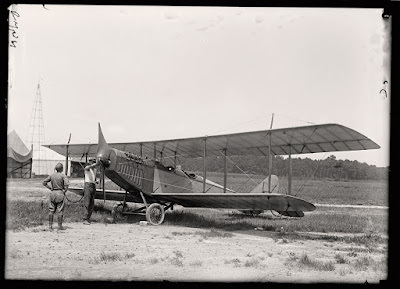 Aside from all the foreign types that were put through their paces, a number of domestic designs could also be found at Langley in the Summer of '17... including the ubiquitous Curtiss JN-4 Jenny. 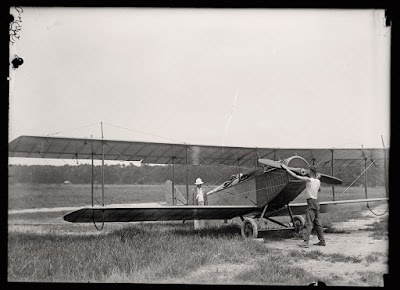 And here's a couple'a shots of one such machine. In the first view the aircraft is fitted with an experimental 'Olmstead Propeller', while in the second view it has a standard prop. 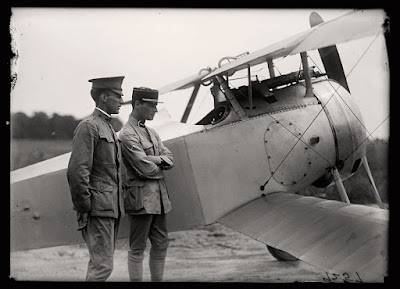 Shortly after entering the First World War in April of 1917, the U.S.A., woefully unprepared for war in the air, had to play a game of catch-up and began evaluating foreign aircraft to produce under license at home and for use 'over there'. Among the many types evaluated was the Nieuport 17. 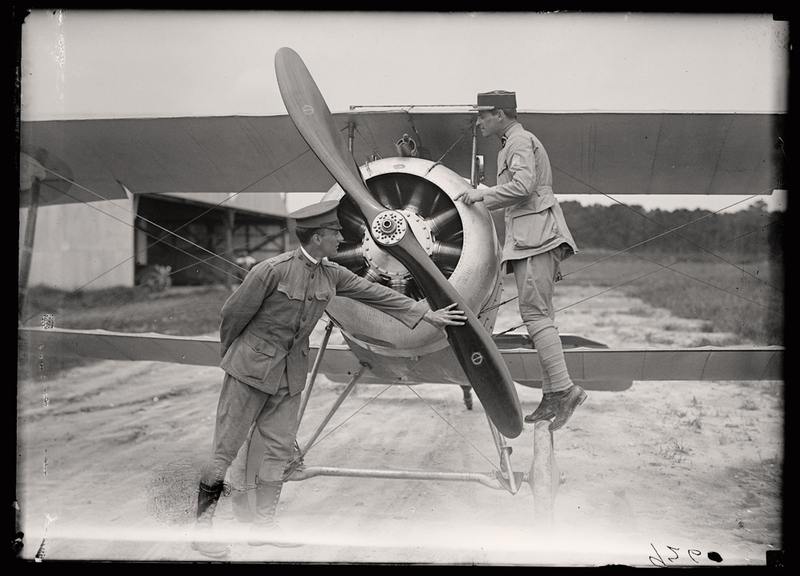 The following photos show Lt. Emmanuel Lemaitre of the Aéronautique Militaire, one of twelve French airmen sent to the U.S.A. in June of 1917 as instructors, looking over Nieuport #2474 with Capt. J.C. Bartolf of the U.S. Army Signal Corps' 5th Aviation School Squadron at Langley Field in Virginia. 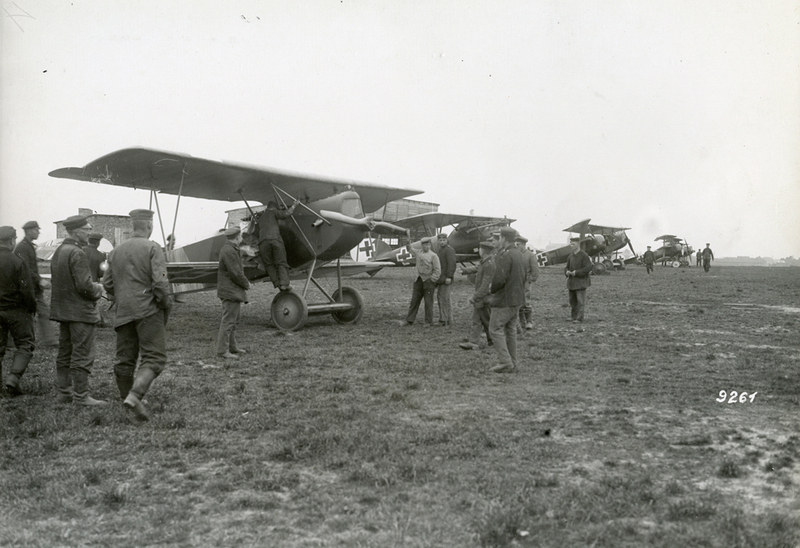 "Officers and S.E.5a Scouts of No. 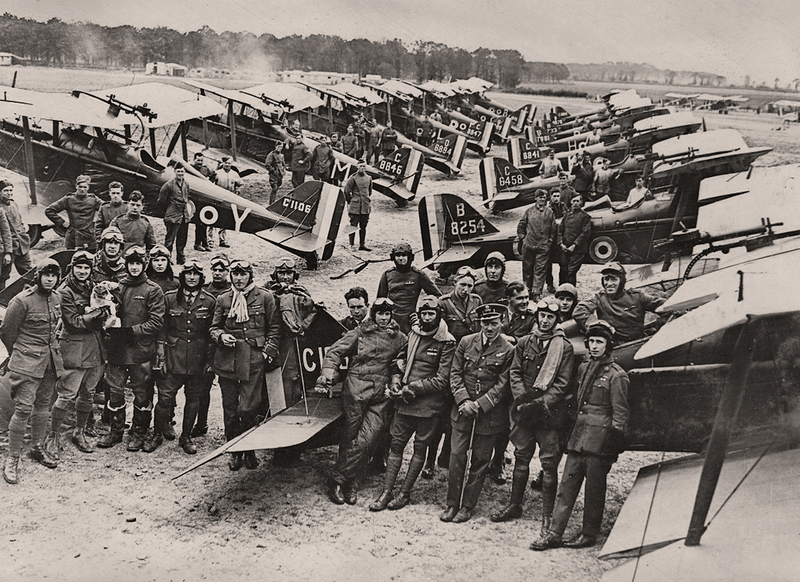 1 Squadron, RAF, at Clairmarais aerdrome, 3 July 1918."